Proterra, a leading manufacturer of all-electric buses, unveiled this week a new battery pack to power its Catalyst XR bus pictured above. The new pack holds 28 percent more energy which adds up to an impressive 330 kWh of energy capacity. As of March 2016, Proterra had 63 buses on the roads across 10 states. Now the company says that all current Catalyst XR customers will receive a complimentary upgrade with the new battery pack. 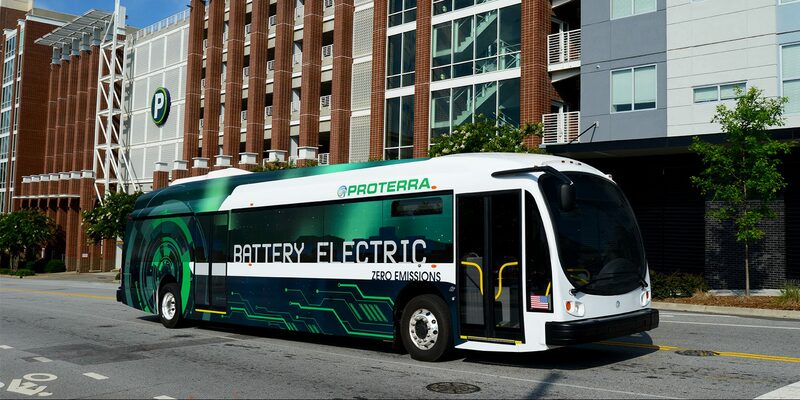 Proterra is based in South Carolina, but the new battery pack was developed out of the company’s battery-engineering lab in Silicon Valley. Proterra recruited several battery engineering veterans to develop its latest battery pack, including long time Tesla battery engineer, Dustin Grace. Grace is now heading Proterra’s battery engineering program, but prior to joining the bus maker in September last year, he had an 8-year tenure at Tesla where he was a key team member on several of Tesla’s battery pack programs, including for the 2010 Smart ForTwo EV, 2012 Tesla Model S, 2014 Mercedes-Benz B-Class Electric Drive and more recently the Model 3. Proterra’s 40’ battery electric bus can travel an impressive 194 miles on a single charge and achieve a best-in-class efficiency rating of 22 MPGe.